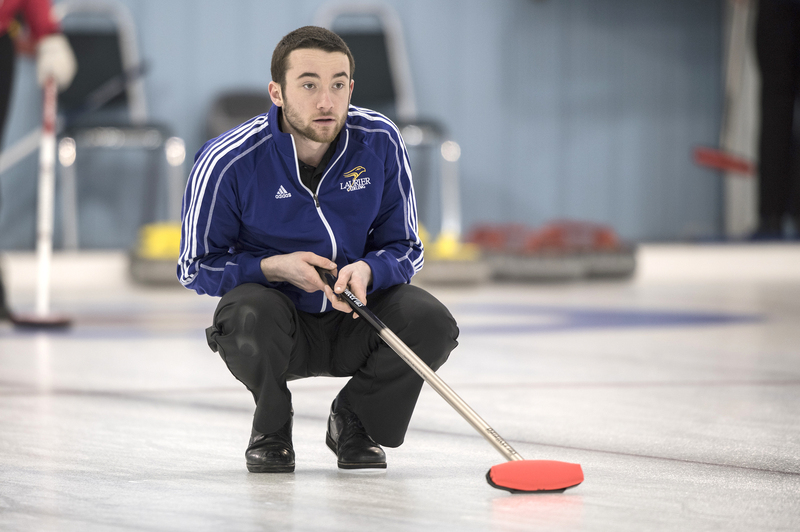 After capturing the Canadian Interuniversity Sport bronze medal and provincial silver the previous year, fourth-year skip Aaron Squires and the Wilfrid Laurier University men’s curling team can add an Ontario University Athletics gold medal to their growing collection of hardware. The Hawks captured gold after winning the championship final against the Western Mustangs 4-3 in eight ends. The gold medal has eluded Squires and the rink during their career. They fell short the previous year when Squires came down with an illness the day of the championship final, when the Hawks captured silver. The win also ended a seven-year gold drought, as the men’s curling team has not won an OUA gold medal since the 2008 season. “Our goal throughout the season, because we had the same team as last year was to medal at OUAs and our entire season so far this year has been with that goal in mind, despite the fact that we are the host university for CIS, we were not going to be complacent,” head coach Glenn Paulley said. The Hawks took the long route through playoffs, finishing third place in round robin play and drawing against the University of Ontario Institute of Technology in the quarterfinals. After defeating the Ridgebacks in a thrilling 5-3 victory, the Hawks were faced with a tough task in drawing the undefeated Brock Badgers in the semifinals. After dropping their round robin game against the Badgers, the Hawks went into the semifinal game with a championship final berth on the line. The rink took the lead by scoring a deuce with the hammer in the fifth end, and then stole another deuce in the sixth to take a commanding 6-3 lead. The Hawks would limit the Badgers to drawing for a single and held on to collect another deuce to advance in an 8-4 victory. The rink showed resiliency in the final as Western came out firing, taking an early lead and limiting the Hawks chances to score in the third end. The Hawks would turn the tables and steal three points in the next three ends to take a 4-2 lead going into the final stretch. That was all the rink needed to secure OUA gold. Despite their finish the previous three years, Squires and the rink were determined to build towards OUA gold, realizing that capturing it would require time. The rink will go for CIS gold when they compete at nationals on March 18 at 8:30 a.m. at the K-W Granite Club. Their opponent remains to be determined. 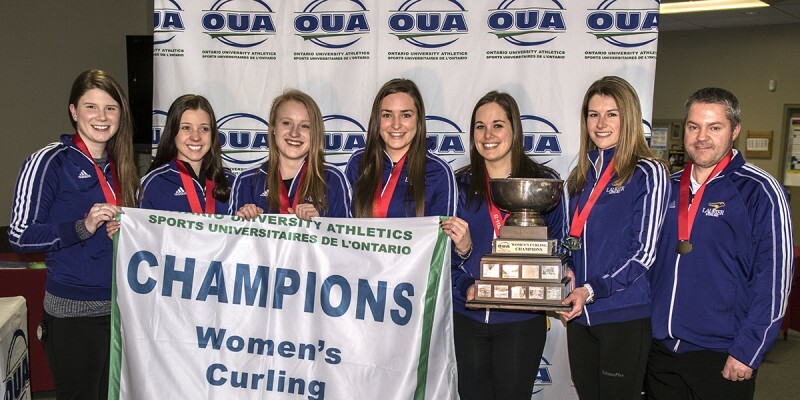 For the fourth time in five years, the Wilfrid Laurier University women’s curling team won the gold medal at the Ontario University Athletics championships. Skipped by third-year Carly Howard, the team defeated the Brock Badgers 5-3 and the Carleton Ravens 5-4 in the playoffs and earned their spot in the Canadian Interuniversity Sport nationals, held at Laurier from March 18 to 21. After securing first place and earning a bye into the semifinals by beating the previously undefeated Guelph Gryphons in round robin play, the Hawks started their bid for gold drawing against the Carleton Ravens. Unfortunately for the rink, the rock picked in the fourth end, which led to the Ravens stealing a point and leading 4-1 coming into the fourth end break. Howard and the team did not feel discouraged by the scoreboard. Instead, they took an end by end approach to the rest of the game. “It just took me a minute to realize that we’re only down three, and we can come back, and we have come back, years before, and that’s all that we need right?” Howard said. The rink stole four points in the second half of the draw and earn their spot in the gold medal game. They never looked back from there. The Hawks took three points in the third end to take the lead in their game against Brock and forced the Badgers to settle for a single point. The rink retook the hammer and followed up with a deuce in the sixth end and limited the Badgers opportunities to take a 5-3 lead coming into the final end. Laurier continued knocking Brock’s stones out of play, and secured the gold medal and the championship banner. Varsity coach Jason Rice was happy with the way the team persevered through the semifinals to win the gold medal game. “It’s huge for Wilfrid Laurier — the whole curling program — and the team played phenomenal. We set our goals this season and to be able to fulfill them is just phenomenal going into CIS,” he said. According to Rice, it was important for the Hawks to maintain that momentum gained from winning both playoff games coming into CIS nationals next month. “It’s going to give us a lot of good momentum coming into nationals. To be able to say that we’re not just the host but we’re also OUA champions,” he said. The Hawks will begin their road for CIS gold on March 18 at 12 p.m., with their opponent yet to be determined. All draws will be played at the K-W Granite Club, where Laurier will have home ice advantage.